Aiming at the non-stationary characteristics of gas outburst time series, a novel gas outburst prediction model is presented in this paper. The proposed model is based on the extreme learning machine and empirical mode decomposition. First, the gas concentration time series is decomposed into a series of subsequence and residual quantity with EMD in order to reduce the calculation of local signal analysis for gas concentration in the scale and improve the accuracy of prediction. Then, each of the subsequence and residual quantity is predicted with ELM. Finally, the resultant prediction is obtained by combining the molecular sequences and residual quantity prediction. 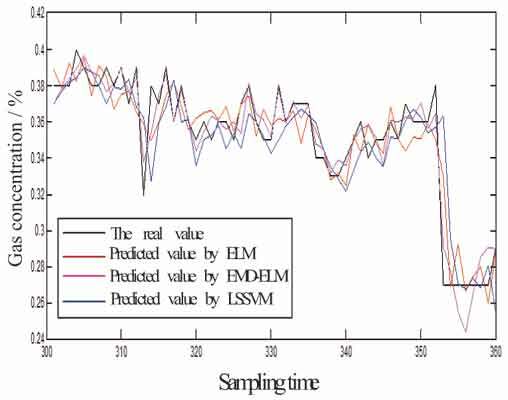 Considering the acquisition of gas concentration at mine working face as an example, the simulation results show that the EMD - ELM model is superior than ELM and LSSVM (Least Squares Support Vector Machine) model in prediction accuracy and the training speed. Empirical mode decomposition. extreme learning machine, gas outburst, prediction. Department of Electrical and Information Engineering, Anhui University of Science and Technology, Huainan, 232001, China.